This Friday, February 1st, marks the unveiling of the new EP via the superstar duo “She Made Me Do It.” “Drenched” is a tantalizing electro-guitar driven epinephrine based magnetism, saturated with anthemic choruses, darkened and haunting society influenced lyrics, and evocatively spectacular guitar solos. 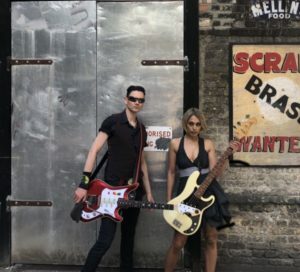 “Drench”, the collaboration of the alluring Shaheena Dax, (Rachel Stamp), on bass and powerfully vulnerable vocals, and Will Crewdson, (Adam Ant, The Selecter, Rachel Stamp, Scant Regard, Bow Wow Wow, just to name a few), on extreme guitar. Drummer for the duo just happens to be bassist for Adam Ant, Joe Holweger. The 4 tracks on the EP, “Bones”, “Broken Morning”, “Ashes” and “Time”, contain cinematic musical landscapes unafraid of short, sharp verses and meaningful crisp choruses. The record varies from past releases in that it is even more guitar driven, yet it still maintains its electronic flair. The music has a destiny and a soul. I spoke with both Shaheena and Will regarding “Drenched”, it’s inspirations and future endeavors for “She Made Me Do It”. The band will be appearing at The Finsbury in London on Monday February 25th at 7:00 PM. Louder than War: So who writes the music? Will: We both wrote the music, pretty even, 50/50. Is their a message within your lyrics that you’re trying to get out there? Shaheena: I guess in the lyric there is a political side of things. I guess I’m talking about things like anxiety and loneliness and war. Things like that. I mean it depends, people might see other things in the writing. I think of things a lot when I see the news and all of that. I think there is definitely a reflection of our difficult times. Yes, it is discouraging. I feel like this album is sonically relevant but it could have also been written in the 80’s. Shaheena: A lot of music that we like is coming from back then. If you think of the 80’s as having lots of pop music and very colorful, there was also a whole other side to the ’80s that was pretty dark. Will: Thank you. A lot of people have been picking up on it. We’re thinking about re-launching that after the EP is out. We’re working on a video for it and we just want it to have a bit more of an impact than being a part of an EP. The song is awesome. If you could say anything about the EP to promote it, what would you say? Will: I just think every track on there feels like the best we’ve ever done on one 4 track EP condensed really. I think that different kinds of people will like it because it’s very guitar-based now. We’ve moved away from the electronics side of it which we had on our first couple of albums. That was a big part of it, but now we are sort of like organic. We have drums and everything. That drummer would be Joe. Will: Yeah Joe…. So I just think it is our best songs. I love all our songs but these are the cream of the crop. So I would advise anyone who likes catchy choruses, big guitarists, heavy sounding songs to give it a listen. Why do you think you became more guitar driven as opposed to electronic this time around? Shaheena: I have to say that one of the main difference with these songs I think is that I am playing bass now and some of the ideas were started on the bass. So a lot of it was me and Will playing bass and guitar together, and that’s how we got this new sound. Will: Because the reason is when we use to play live there was just two of us so we had electronic backing. Now since we’ve got Joe on drums, it’s basically since then that it’s got a lot more rock-based and organic sounding. Shaheena: It’s going back to playing together as a band with drums, his guitar as opposed to just electronically, just us in the front. It’s a whole different feeling on stage now. For me, it feels much more intense now actually. I really like where we are going. Your set to play at the Finsbury I noticed? Will: Yeah, that’s our next gig. The 25th of February. So we’re looking forward to that. I realize that you just completed this record, but what is next for She M.M.D.I.? Will: The idea is to do a series of EPs, so we’re going to work on another one straight away, and try and get that out. It might turn out to be a full album by the time we get done with three or four of them. Maybe just a selection of stuff that we put out in the smaller releases. Each one is going to have a different theme. Hopefully they will all fit together and make sense as a whole album. But we will probably have newer tracks on the album as well. That’s the idea. That will hold people’s attention. Will: Yeah, just think it’s better these days because people have less attention in general. The more blasting you do the better. Shaheena: I want to do more videos now, like “Bones” that we just did. I love working with Duncan, he’s done quite a few of our videos. I love developing ideas with him, he’s so great. So we will do more. Are you on a label? Will: No we just do it all ourselves. We’ve had dealings with labels in the past with previous bands. We always wound up with the wrong people, people who didn’t understand what we were doing. These days it’s so much easier to have control and do exactly what you want. The first few albums when they came out were distributed by a distributor so we got them in the shops and stuff. Basically, the audience for this can be reached online, and then we’ve got complete control of it. So that’s how we’re doing it. We are also doing vinyl for the first time. So I’ll be sending all of those out next week. My tongue will be dry from licking all the stamps. But I’d rather lick the stamps myself then get someone else’s tongue on them. Do you two have musical disputes? Will: No more than any other band. Shaheena: That’s how we met. We were both in a previous band. We become more like people working together in a band when we’re writing. Will: Originally we were both friends in a band. So we’ve kind of been through that already. The experience of that makes it easier I think. You can just relate it to how it was before and you get used it. Obviously, you’re going to have differences. It’s kind of easier because when you don’t know someone that well people sometimes take things more personally. But really, I just get on with everyone. If you could have me ask you any question in the world, what is it that you’d want me to ask you? Shaheena: I can tell you that I really love singing these new songs. We did a gig a few weeks ago. Maybe you could ask a bit more about the meaning of the songs. Some of the ideas behind them. For example, “Ashes” to me is about PTSD. Shaheena: Yeah. Because I read a lot of books about the front line, people like reporters, journalists, or soldiers that have written memoirs, all the way from the Vietnam War and before that up to the first world war. I read a lot of stuff about that so that was in my head with that song. What about my favorite, “Broken Morning”, what is that about? Shaheena: That’s different. That’s the first time I thought about something that’s quite universal, like lust and heartbreak. A lot of the songs you hear on the radio about these things I find so cheesy and I never relate to those heartbreak songs. I wanted to still bring the idea about sadness and lust. But it is slightly upbeat and beautiful. I wanted a contrast there. That song is going to major. Like a radio hit. Will: Yeah, whatever that is. You can have the most radio friendly hit in the world but it’s another thing getting it on the radio. Shaheena: I want to say this, I think it’s one of Will’s best guitar solos. Will: I actually worked it out this time. Shaheena: His guitar solo is the musical representation of what the song means, with the lyrics. Will: Its just one of those songs where all the pieces just work together. We are really pleased with that one.